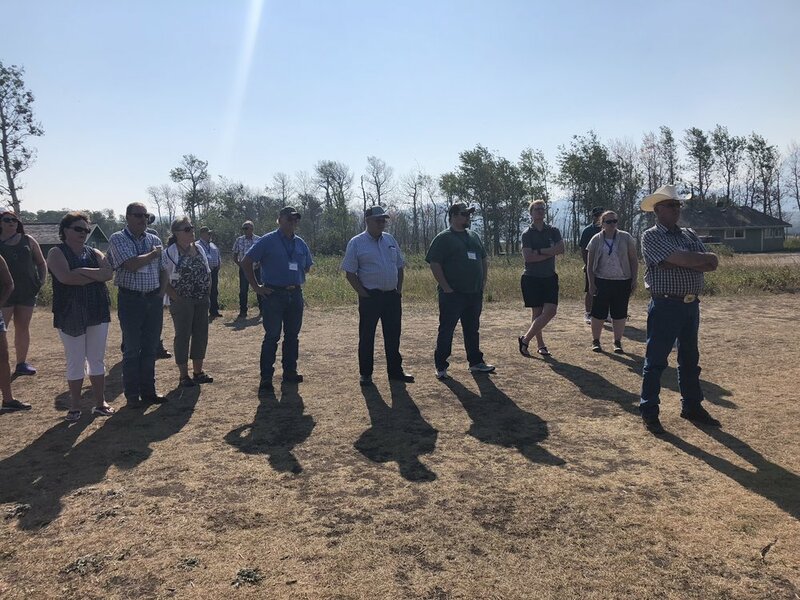 · Municipal District of Pincher Creek - Transboundary Weeds, Water and Stewardship Tour, going from Waterton Park to Castle Parks, into the Crowsnest Pass and the East Kootenays. · Municipal District of Willow Creek - Continued support of Bio-control Agent projects to control invasive weed species along the Oldman river and various tributaries. · Cody Spencer, Sweetgrass Bison - Oldman River Riparian Fencing & Restoration – Phase 1 along the lower Oldman river. · Pincher Creek Watershed Group - 16th Annual Blueweed Blitz along Pincher creek and its tributaries. The MD of Pincher Creek Transboundary Water Weeds and Stewardship tour drew 80 delegates. This tour increased the level of awareness of issues regarding land and water management, as well as invasive species in the area. It fostered relationships across multiple locations to increase collaboration and generated an appetite for more tours of this nature. The event had a high level of participation, sparking questions and discussions among all participants. The MD of Willow Creek completed two releases of bio-control agents to control invasive weed species along the Oldman River. They also hosted a weed identification school in Fort Macleod on June 20, 2018. These events increased topical awareness and provided education on invasive species in the area, while also sparking interest in watershed stewardship and invasive species control. Sweetgrass Bison completed a wildlife friendly fence, a project that now helps control river access to over 80 bison. With the new fence, grazing periods can be scheduled and time can be allocated for the areas to regenerate and vegetation to regrow. While designed to control bison, the fence is wildlife friendly and still allows local deer populations to travel within their valley home. The Blueweed Blitz was a community event where more than 80 participants removed over 2000 lbs of weeds. Millions of seeds were removed from the creek and countless weeds were sprayed along with the removal. This event draws light to the importance of managing and eliminating invasive species—including weeds—in our watershed. It also serves to educate the public about invasive species, inspire watershed stewardship, and bring communities together in the interest of the common good. This event resulted in 254 kilometres of streambank restored. We are very excited to have been able to participate in each these projects throughout the course of 2018. They are great examples of the change that can be made when individuals and communities come together with a unified goal. We look forward to what 2019 brings!